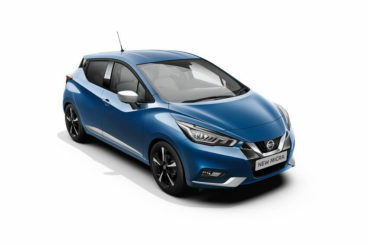 Former European Car of the Year the Nissan Micra Hatchback is priced low, boasts a roomy interior and offers an easy going driving experience. And thanks to excellent all-round visibility, it makes a fab choice for young new drivers who are a tad unsure of themselves. It’s easy to see the road ahead, and easy to park. The Micra is a familiar face, having been around for over thirty years. Buyers love its cheery disposition, usefulness and low running costs. As such, it’s built up a loyal fan base that it’s adding to with each new release. The problem it faces is that its rivals have got even better. Is this one worth your money? OSV takes a look with our Nissan Micra Hatchback review. The new Micra is the ideal companion as you potter about the town, but thanks to poor refinement and unsophisticated suspension, it isn’t much fun on the open road. Put your foot down, and the car’s vulnerabilities are left exposed. The engine is noisy, while road and wind noise easily find their way into the cabin. All in all, longer journeys on the motorway will become rather tiresome, especially if you’ll be making them often. Corners are a bit of a challenge for the new Micra Hatchback, too, thanks to a lot of body roll and steering that is overly light. Still, this is a Micra and what buyers have always enjoyed about it is its safety and predictability. You know what you’re going to get from it, and in that sense, it isn’t going to let you down. Responsive controls, light steering and excellent visibility all ensure that it’s a very competent city car. There is only one engine available – 1.2-litre three-pot petrol unit that is available in either 79 or 97 bhp guise. The less powerful of the two is naturally aspirated, and could be said to be the better choice of the two. It’s cheaper to buy and run, and feels right at home in the city. However, the supercharged 97bhp variant is quicker and offers a bit more shove, and can get you from rest to 62mph in 11.3 seconds before maxing out at 112mph. Compared this with the 79bhp variant, which takes 13.7 seconds to cover the 0-62mph and the difference is quite significant. You can pair the engines up with a CVT automatic ‘box as opposed to the standard manual one, but this will have a negative impact on their speed. The CVT automatic transmission is also guilty of emitting a very nasty, very constant droning sound. There is no diesel engine available. The interior is not fantastic in terms of aesthetics, and looks a bit drab for our liking. The cabin is a hotchpotch of cheap plastics that are tough and built to last, but which aren’t pleasant to look at. However, the car is comfortable, while the brand have introduced a few new design features that are refreshing. The dash, for example, comes with a centre console whose controls are arranged in an easy-on-the-eye circle. And if you opt for some of the more expensive trims, you get Nissan Connect, which includes a big touchscreen in the centre of your dash. It gives the cabin a bit more sparkle. Overall, though, the design of the interior is a bit erratic and lacks the cohesiveness of some of its rivals. And although it feels fairly well-built, there are more robust cabins in this market. The basic trim also misses out on a height-adjustable driver’s seat. The exterior, meanwhile, looks more mature than ever and is now almost unrecognisable to the quirky original that launched over three decades ago. This is no bad thing, as the car now has a wider appeal. It looks almost sophisticated. Visibility is one of this car’s strengths; not only do you get a good view of the road ahead of you, but all-round visibility makes it easy to park. And despite its compact dimensions, there is quite a lot of interior space on offer here. Getting in and out of this five-door is simple enough, thanks to wide-opening rear doors. Head and legroom is reasonable upfront and in the back, while the boot measures 265-litres. It’s worth overlooking the entry-level model as it’s as basic as basic does. As well as the aforementioned height-adjustable driver’s seat, you also don’t get front fog lamps, alloys and air conditioning. The Acenta model is a much better choice, and adds 15” alloys, body-coloured mirrors and door handles, cruise controls, a speed limiter, and rain sensors. The N-Tec trim comes with rear parking sensors, automatic climate control, and a touchscreen sat-nav, while the Tekna model adds a keyless start and suede trim. As this is a budget car, it’s probably a good idea that you don’t spend too much on the optional extras. You can get a digital radio for £200, while lifting the gloomy interior with pearlescent or metallic paint will cost you £500. It’s worth adding. Prices for the new car start out from £8,000 and rise to around £13,500. If you’re thinking of leasing it, you can pick up a deal from as little as £85 + VAT per month, which makes it the ideal budget car. In terms of its running costs, the little Micra does okay. But in the absence of a diesel engine, many of its rivals can offer better numbers. The petrols are small and come fitted with stop-start technology, which has boosted fuel economy by almost 5%. The 1.2-litre petrol engine in 79bhp guise can average returns of around 56.5mpg, and costs £30 a year in road tax. The 97bhp version of the 1.2 comes supercharged, and achieves very impressive fuel economy returns of 68.9mpg. You can fit either engine with a CVT automatic gearbox, but doing so will drop the fuel economy. The Micra doesn’t cost much to insure, with the cheapest model sitting in group 5. Certainly, not all small hatchback’s have accommodating rears, but the Micra pulls this off despite its compact dimensions. This is a real strength. There is no diesel options, so the Micra’s mpg figures won’t be the best in class. But the petrol engines are pleasingly efficient. Maybe Nissan knew their interior looked a bit cheap, which is why they decided to swamp the more expensive models with high-tech gadgets. However, it’s impossible to mask what it essentially a budget cabin. The brand have done away with everything that made this car distinctive in the past in a bid to give it mass appeal. But all they’ve done is weaken its looks. 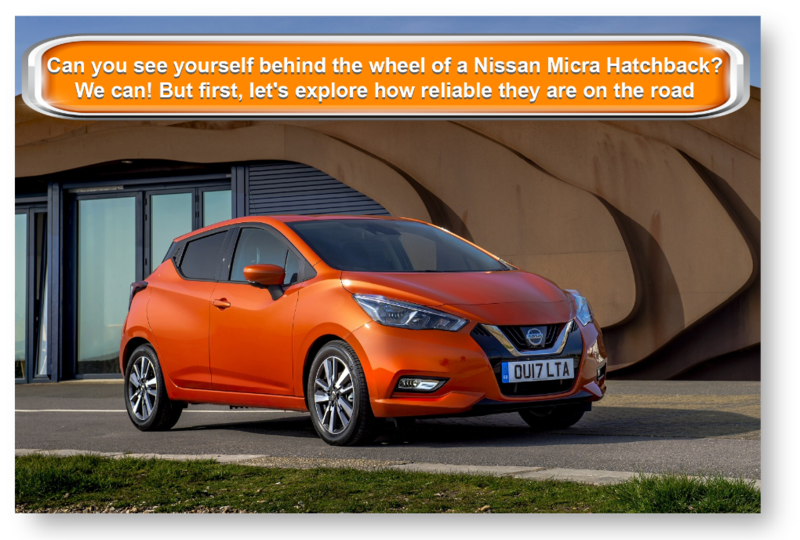 Let’s see how the car measures up against its closest rivals in the comparison section of our Nissan Micra Hatchback review. The new Fiat 500 Hatchback is a fun-loving retro car that is very easy to live with. Like the Micra, the new 500 feels right at home in the city, where it looks absolutely fantastic. Stylish, it’s also compact and sports a friendly face. But how is it to drive? The suspension is slightly too firm, but it still does a decent job of absorbing some of our worst bumps and lumps. There is a lot of grip for when you tack bends, although the steering is lacking in feedback. There is also ample body roll, while the gearshift has room for improvement. The engine that is suited the most to the city is a TwinAir two-pot petrol that comes with a turbocharger. At low speeds it can offer a decent amount of power, and can haul you from rest to 62mph in just 10.0 seconds in 104bhp guise. 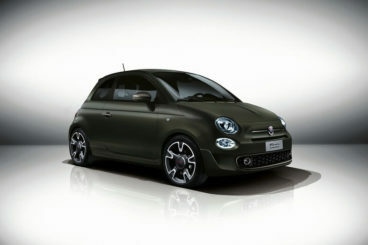 The thrum which the engine emits evokes memories of the original Fiat 500 that launched in the fifties (we say evokes, but the people who this car is aimed at won’t exactly get all nostalgic about the noise). However, while this certainly has undeniable charm, it may end up getting on your nerves. A 1.2-litre petrol is slower than the TwinAir and not as much fun, while a rattly 1.3-litre MultiJet is your best bet if you want a good mix of performance and efficiency – it’s good for fuel economy returns of 83.1mpg. It’s more expensive to buy than the petrol’s, though, and is really only worth it if you’re going to hitting the motorway often. Otherwise, it’s the petrol engines. The 69bhp 1.2-litre Eco engine is the most frugal, and is good for returns of 65.7mpg while being free to tax. The interior is funky and modern, with a brand new infotainment system a highlight. 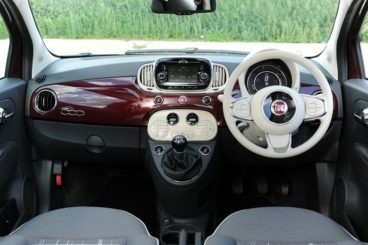 Both inside and outside, the Fiat 500 is more stylish than the “mature” Micra, and it comes with soft seats that are easy to get comfortable in. The dashboard is clean and simple, but its gloss finish will scratch easily. The Fiat 500 loses practicality points because it’s only available as a three-door, but big windows and a small size make it easy enough to park. Four adults should be able to sit in relative comfort, but access to the rear is tricky. However, the front seats slide a fair way forward. The boot is sized only at 185-litres, and also comes with a fairly high boot lip. 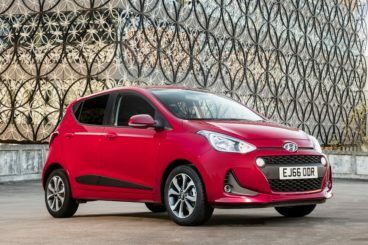 The new Hyundai i10 Hatchback is easily one of the best small hatchback’s on the market right now, and can boast comfort, a roomy interior, efficiency, and a bit of style. The i10 Hatch is actually more fun to drive than we expected. The suspension is a bit stiff, but this doesn’t have to be seen as a negative, and the car is very in the city, thanks to fab visibility, a high driving position and light controls. It’s also very agile. On paper, the 65bhp 1.0-litre is quite sluggish, taking as it does 14.9 seconds to cover the 0-62mph dash. But these figures don’t really tell the full story, and thanks to its light weight and small dimensions, the Hyundai actually feels a lot nippier. If you’ll be spending as much time on the motorway as you will in the city, the 86bhp variant of the 1.2-litre petrol engine is a better bet. It’s quicker on paper, has a bit more welly, and feels very competent at higher speeds. Like the Micra, the i10 Hatchback doesn’t come with a diesel offering. Still, the petrol engines are small and efficient. Although no engine is free to tax, none of them will cost you more than £30. The most frugal is the 1.0-litre unit, which averages fuel economy returns of 60.1mpg. It still doesn’t seem all that long ago when Hyundai interiors just weren’t up to scratch at all, but things are a lot different in 2016. 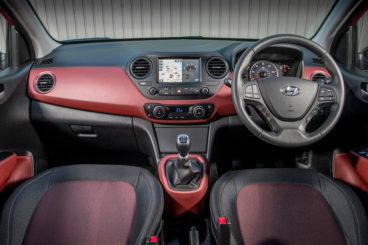 The i10’s cabin is a quiet, comfortable and relaxing place to be. The materials are impressive, while build quality is at an all-time high for the once-insanely budget brand. You get to coat your dash in either orange, red or blue metallic finish, as well as your external paint work and seat trim. And despite being a compact car, there is a good amount of interior space available. Like the Micra, it comes with five doors, offers good visibility, and is easy to park. Four adults will be fine with the head and leg room on offer, while the 252-litre boot is class-leading. So, the quintessential budget car has done it again. Budget without being budget-budget, it’s spacious, well-equipped and a very willing runner in and around the town. It is let down by a rather cheap-looking interior, but high-tech gadgets brighten things up a bit, while everything else you want from a small hatchback (good visibility, easy to park) is all there. To sum up, the new Nissan Micra Hatchback won’t be winning any more European Car of the Year awards, but it represents good value for money at its price point. Looking For A Price For The Nissan Micra Hatchback?